(1) Mix H.K. fried glutinous rice flour, icing sugar and crisco shortening together. (2) Add in essence and colouring into the water but you may not need to use up all the water. Stop when you get a nice soft dough. Leave aside to rest for 30 mins. 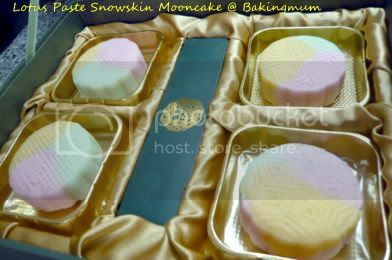 (4) Wrap paste with snow skin and press into mooncake mould and then knock out. (5) Keep in the fridge until cold and set. Thanks for sharing your recipe. Not sure if I have the courage to try now (a bit late huh?) but maybe next year ... or maybe next month .. why wait till its festival time to enjoy what you wanna enjoy right? What is Kou Fen/Hong Kong Glutinous Rice Flour? I am in Toronto, don't think we have that here. Is there a substitute? Kou Fen is glutinous rice flour that has been fried already. It is already cooked so that is why you only need to mix with icing sugar, shortening, water and essence and it can be eaten. If you cannot find ready bought kou fen, you can just fry the normal glutinous rice flour like how you use fry the tapioca flour to make kueh bangkit. Hi Mellie, gelatine is the latter. besides making snowskin, what can we do with the cooked glutinous rice flour? Hi, yr recipes are awesome! 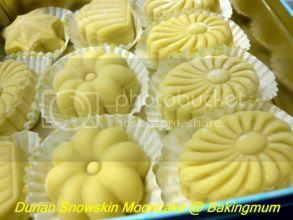 Cud you please let me know the recipe for the durian paste mooncake (the fillings). Hi Laura, I did not follow any recipe for the durian filling. What I did was to mix fresh durian blended into the lotus paste. If you do this, you need to be very careful because depending on how much you add to the lotus paste, the paste will be very soft and it will not be easy to roll into a ball and wrap. The lotus paste will be very soft. When I did this, I freeze the durian paste before I start to wrap them with the snowskin. What is the brand of Hong Kong fried glutinous rice flour that you use? I have bought glutinous rice flour from NTUC supermarket before (to make tapioca kueh, etc) but I do not seem to recall seeing Hong Kong fried glutinous rice flour in NTUC supermarket. Pebbles, I bought the HK glutious rice flour from Sun Lik at Seah Street. The Kou Fen from PH should be cooked already. Make sure you did not buy the premix. If it is the premix kou fen, then no need to add anymore sugar. You made your own lotus paste or you bought them ? For the melon seed, did you buy them at PH too ? Coz i dun remember seeing melon seed at NTUC. Tibits1, I bought the lotus paste. The melon seed is bought from Phoon Huat. You must toast the melon seed before you use them. Tibits1, soak the raisins in rum for a few hours or 1 to 2 days depending on how strong the taste you want. Add this rum-soaked raisins into the lotus paste. These are beautiful. If I only have normal glutinous rice flour, how long should I fry the flour in a pan for? How do I know when it is done? I don't want to make people eat raw flour!! Hello! Is it must to add banana essence in the snowskin mixture? Can I use other essences? No, you can use other kind of essence. Example, for pandan lotus paste, some will use pandan essence. Actually it depends on what the filling is going to be. If it is chocolate lotus paste, some people will add chocolate emulco.